Cleaning your house in a hurry? 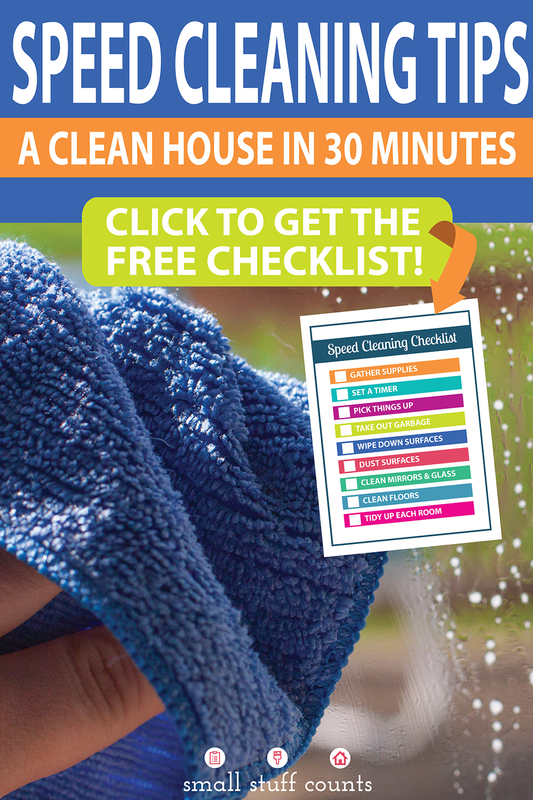 Here’s a free printable checklist of speed cleaning tips for cleaning your entire house in 30 minutes or less. The last thing you want to do is spend any more time cleaning your house than you have to, right? I’m may love organizing, but I am not a big fan of cleaning. That’s why I love speed cleaning the house on the weekends so I can get it over with as fast as possible. 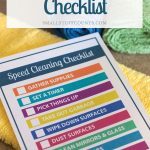 This speed cleaning routine is also really useful to do if you are hosting guests and need to clean the house in a hurry. We moved into our new house earlier this month, and one thing I noticed as I was packing was how many cleaning supplies I had. There were so many bottles of cleaners under our sink and in our closet! So now that we are settling in and unpacking this house, one of my goals is to simplify the cleaning products we use. As I was sorting through all of the cleaners I’ve accumulated over the past few years, I realized we really only need a few basic cleaners to keep the house clean. 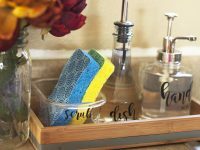 A window and glass cleaner, an all-purpose cleaner and something for dusting are honestly the only three cleaners necessary for keeping our house clean and ready for Thanksgiving company. 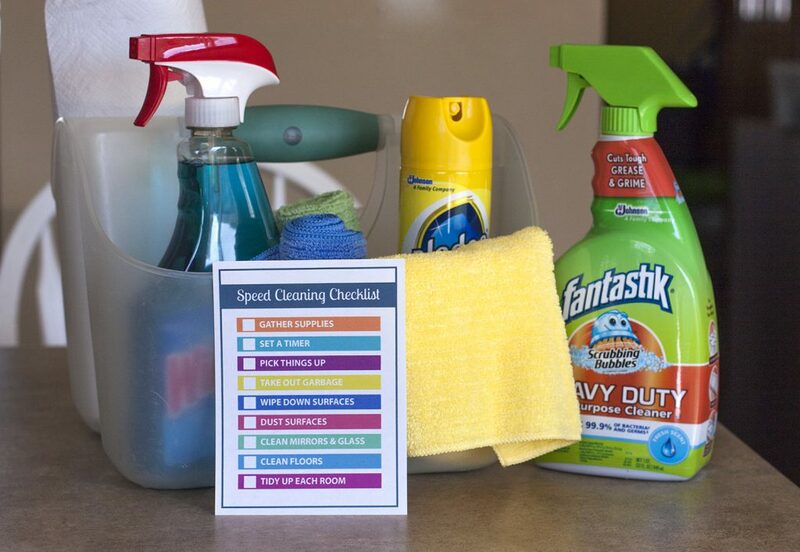 Simplifying your cleaning supplies is my number one speed cleaning tip! 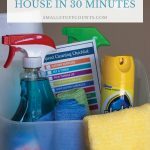 Keep reading for all of my speed cleaning tips that will help you clean your house in a hurry before those hungry Thanksgiving guests arrive. Make things simple by organizing your cleaners and tools in a caddy with a handle. I added my favorite supplies to a plastic caddy that will be stored under our kitchen sink so it’s convenient to grab whenever I need to clean in a hurry. My cleaning caddy is stocked with Windex® Original Glass Cleaner, Pledge® Lemon Clean, Scrubbing Bubbles® Fantastik®, lint-free microfiber cloths, and paper towels. 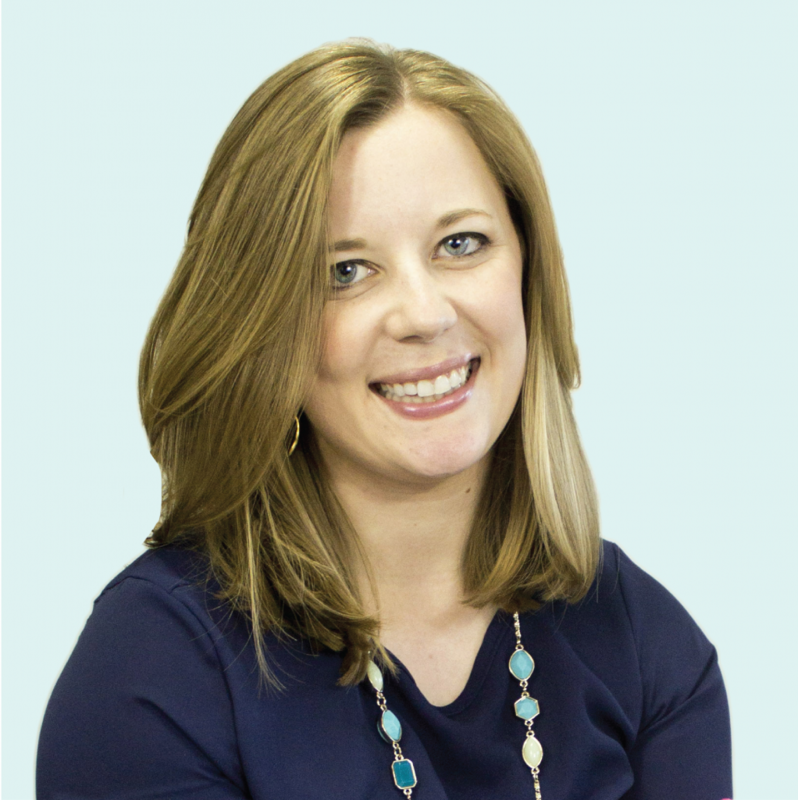 You’ll work faster and more efficiently when the clock is ticking! Give yourself a time limit, set a timer and start cleaning! 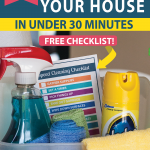 I think 30 minutes is a realistic amount of time to speed clean your whole house. But if you’re really pressed for time go ahead and set your timer for 10 or 15 minutes and see how much you can get done in the time you have. Pick up all of the garbage and items that are out of place. I like to use a plastic grocery bag for picking up trash and a small laundry basket for gathering up all of the odds and ends that need to be returned to their rightful place. Toss the bag of garbage in the trash can and put the items in your basket away where they belong. If you’re pressed for time, you can always stash the basket of items out of sight and deal with them later. Empty the garbages in each room to get rid of any lingering smells and put new garbage bags in each trash can. 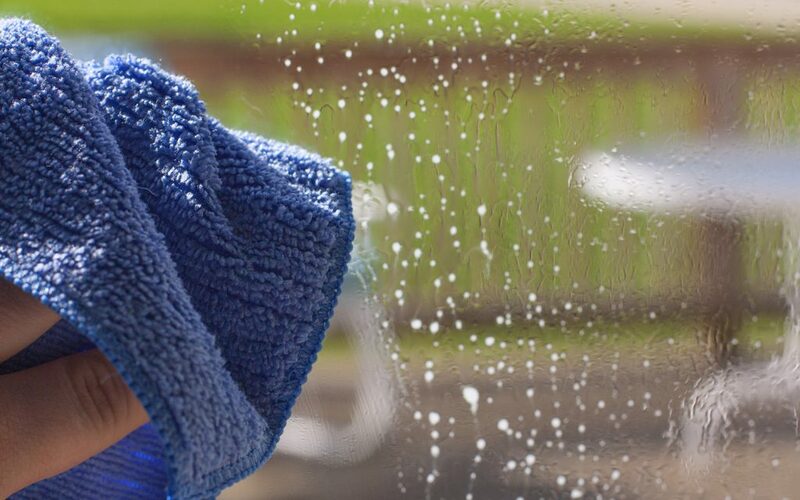 Use an all-purpose cleaner and microfiber cloth to clean hard surfaces like bathroom vanities, toilets, the stove, and kitchen counters. 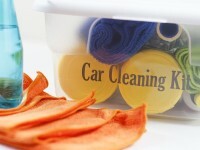 Things will instantly feel cleaner once those surfaces are clear of clutter and sparkling clean. 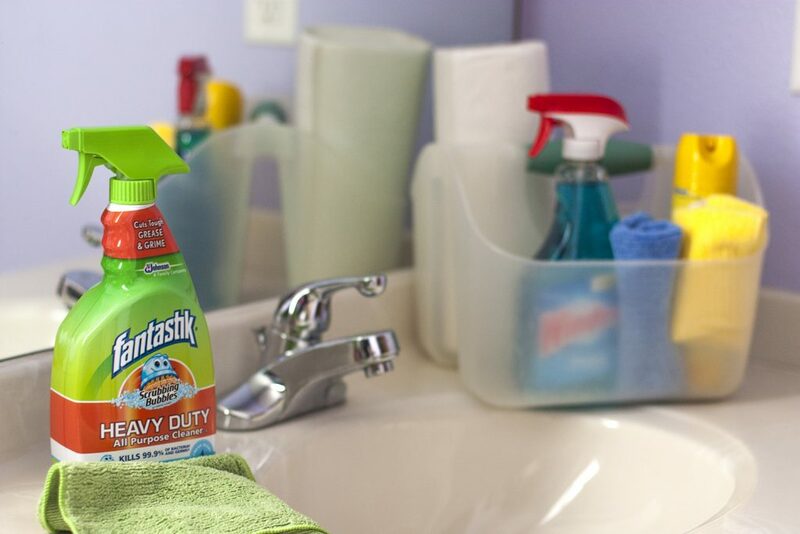 My cleaning caddy is stocked with Scrubbing Bubbles® Fantastik® for this purpose. It removes grease, grime, soap scum, and other household soils. It also kills 99% of bacteria and germs. Dusting makes such a big difference! Take a couple of minutes to dust all of the shelves and tables in each room. Pledge® and a microfiber cloth will make this task easy. 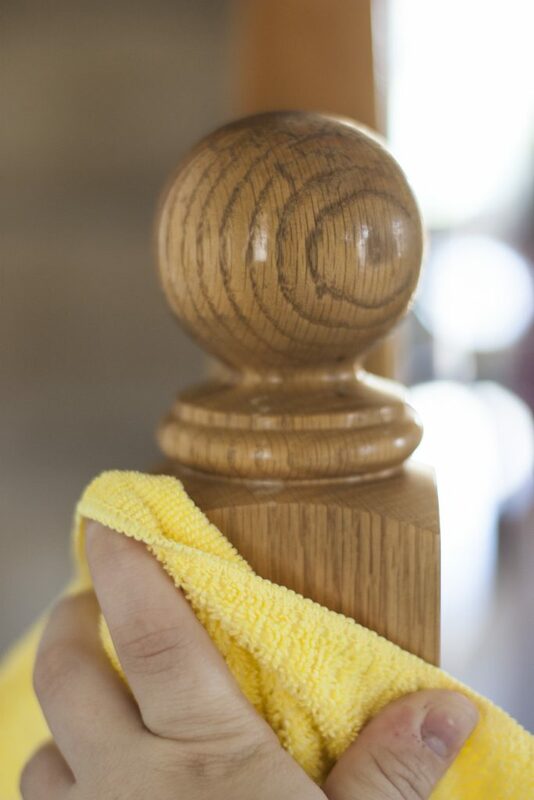 Pledge® Lemon Clean can be used on furniture all around the house to quickly clean, condition and protect. And I love the classic lemon scent it leaves behind! 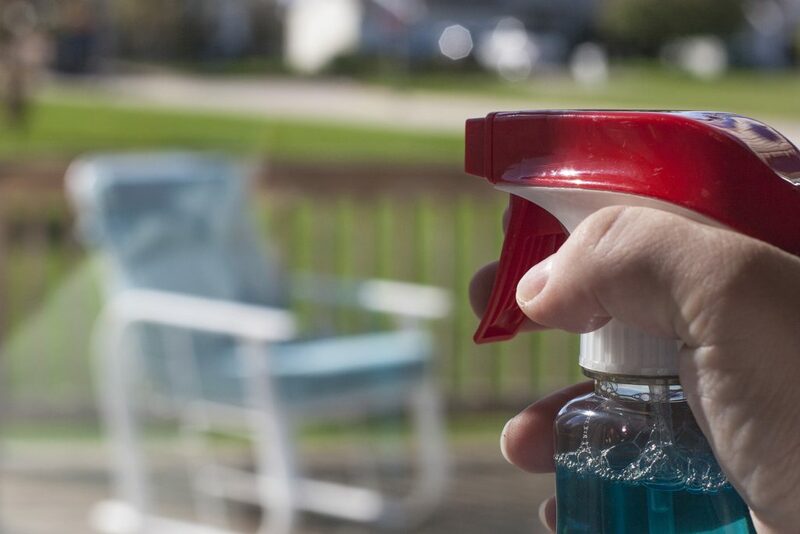 Use Windex® Original Glass Cleaner to clean all of the mirrors, windows and glass surfaces in the house. Removing fingerprints and getting that streak-free shine will make everything feel bright and clean! Once you’ve put away the clutter and cleaned all of the surfaces, it’s time to bust out the vacuum and broom. Do as much as you have time for – even a quick vacuum and sweep can make everything feel clean. If you have more time, mopping would also be great to do. Once the cleaning is all done, use the time remaining to spruce up as many rooms as you can. Start with the rooms your guests will be spending the most time in. Stock the bathrooms with toilet paper, fresh towels and hand soap. Hang fresh towels in the kitchen and light a candle. 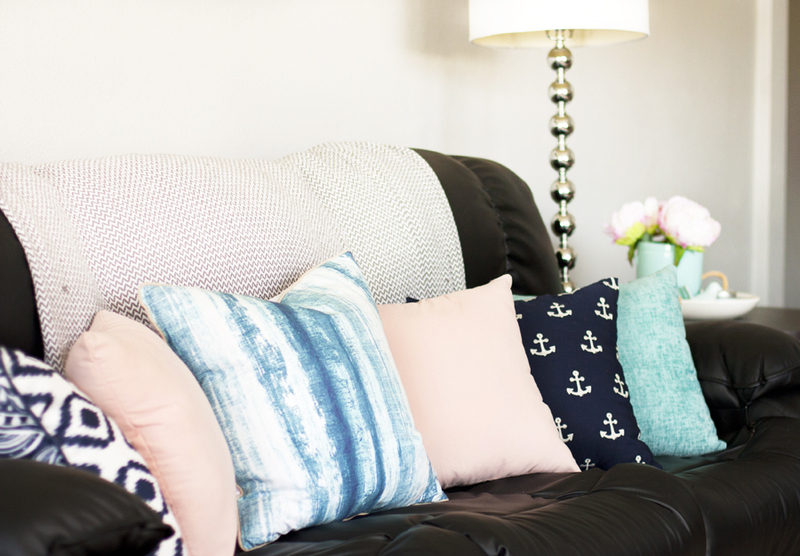 Fluff the throw pillows on the couch. You get the idea! 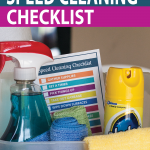 I’m a huge fan of checklists, so I created one for my speed cleaning routine. You’re welcome to use it as well! I printed a copy to tuck in my cleaning caddy for quick reference when I’m scrambling to clean the house before holiday gatherings this year. You could also laminate it and physically check each item off with a wet erase marker. Ready to have a clean and tidy house? 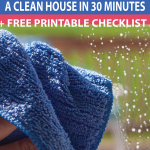 Use this speed cleaning checklist to clean the house in a hurry. 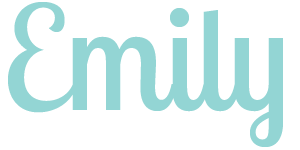 Subscribe to have the free printable sent straight to your inbox and receive weekly organizing tips. Hooray! Your free printable is on its way to your inbox. Send me my free printable! I hope these speed cleaning tips are helpful to you!